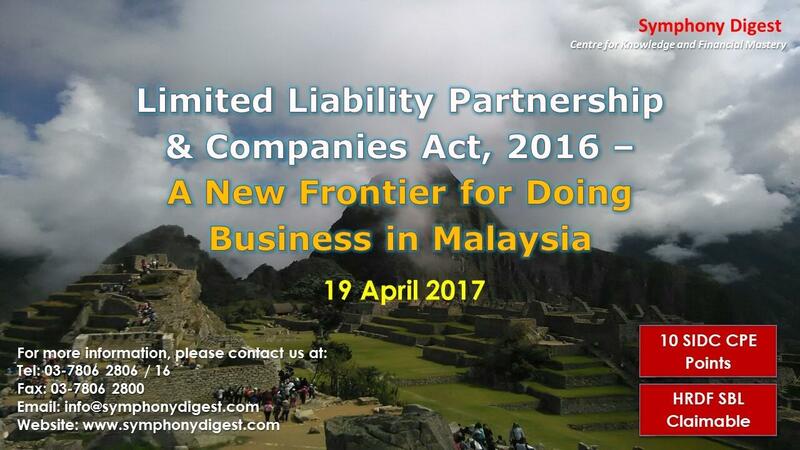 Limited Liability Partnership (“LLP”) was introduced in Malaysia at the end of 2012. As a new business vehicle, it has so many advantages over the Sdn. Bhd set up and the sole proprietorship. Yet, it has not been embraced by the business community. Some bankers are not even sure what documents to ask for when an LLP wants to open bank accounts. Its many advantages – the marriage of a sole proprietorship’s simplicity and cost savings from administrative requirements with the liability limitation of a Sdn. Bhd. – makes it a business vehicle which should be explored. The new Companies Act, 2016 which comes into force in stages in 2017 is most welcomed. It will simplify a lot administrative procedures and cut out some superfluous requirements of the Companies Act, 1967. Most people seem to be struck by the no par value introduction and are scratching their heads on how it works, its treatment and the impact on Redeemable Preference Shares. But could the confusion arise simply because, well, it makes things so simple?